SAN DIEGO — It is a few days before Christmas as this report is being written and it is incredible to be able to say that near limit to limit catches of bluefin tuna are still being made out at the 60 Mile Bank. We recently had a northern weather system come through Southern California, bringing some winds to the area but nothing severe. It’s unclear whether this mild system would cause water temperatures to drop so low as to send the bluefin away. The water in the area of the 60 Mile Bank has been running about 63.8 degrees. 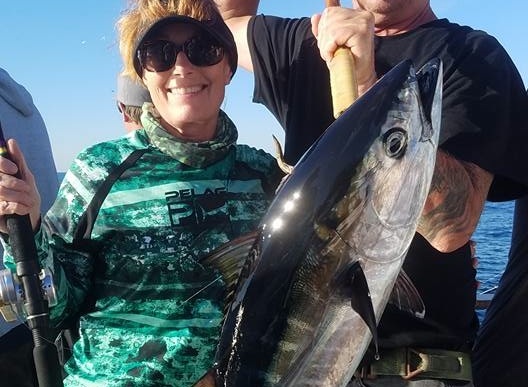 Recent days have seen near limit to limit catches of bluefin tuna at the 60 Mile Bank and the Dec. 20 fishing was no exception. Condor out of Fisherman’s Landing fished an overnight trip with 22 anglers who returned to shore with limits of 44 bluefin tuna. New Lo-Ann out of Point Loma Sportfishing had an overnight trip with 13 anglers catching limits of 26 bluefin tuna and 40 yellowtails. Seaforth Sportfishing had an overnight trip on Tribute with 23 anglers catching 35 bluefin tuna. The bluefin tuna have been in the 15- to 30-pound class and biting best on sardines. Those fishing with iron have also been catching a few bluefin using Flat Fall jigs. Most of the sportboats have been fishing while sitting on the anchor but anglers have also been catching bluefin while drifting or while slow trolling with live sardines. Most anglers are using live bait outfits with fluorocarbon leaders in the 20- to 25-pound range. Using small hooks relative to the size of the live bait has also been a good thing in obtaining the stealth sometimes needed to draw strikes from wary bluefin. The action at the 60 Mile Bank is being found around the upper high spot, which comes up to 53 fathoms. Some of the kelp paddies in the region of the 60 Mile Bank have also been producing good numbers of yellowtail. There has not been much to report in the way of yellowtail action around Los Coronado Islands during the past couple of weeks but there has been good fishing for an assortment of rockfish along with a few bonus bonito and lingcod. The lower end of the 9 Mile Bank has been a productive rockfish zone and hard bottom areas to the north and the northwest of North Island have also been producing a good number of rockfish. Best areas at Los Coronado Islands for a chance at finding a few bonito and yellowtail are the weather side of North Island and the Middle Grounds. Mission Belle out of Point Loma Sportfishing fished a recent trip to Los Coronado Islands and had 17 anglers on a three-quarter-day trip catch six bonito, one lingcod and limits of rockfish (80). There have been pretty good numbers of yellowtail biting outside of Point Loma in recent days, with one day of fishing providing good enough action where a couple of private boaters reported 10 yellowtail catches apiece. The best yellowtail area off Point Loma has been 1 to 2 miles from the Whistler Buoy, while fishing anywhere from southwest of the Whistler Buoy up to northwest of the Whistler Buoy. A few yellowtail and bonito have scratched out at La Jolla. The occasional yellowtail caught at La Jolla tends to be one of the larger 15- to 20-pound fish. The best zone for a chance at a La Jolla yellowtail or at a few bonito has been while fishing outside of the upper end of La Jolla at the area of Northwest. Most of the yellowtail action has come while fishing a sardine on a dropper loop rig that is fished near the bottom. The remainder of the fishing along the San Diego County coast has for good numbers of rockfish. Anglers need to keep in mind the annual two-month rockfish closure goes into effect on Jan. 1, 2018. Some of the better hard bottom rockfish areas along the San Diego County Coast from the south to the north have been while fishing the region of the Whistler Buoy at Point Loma, the Green Tank, Point Loma College, “the 270” out to the west of Mission Bay, the upper end of La Jolla, Del Mar, Leucadia and Box Canyon. I hope you get a chance to get out on the water and enjoy some of the fine December fishing. It is a special gift from nature to have bluefin tuna to target in our local offshore waters this late in the year. If you do not feel like going offshore, there are also yellowtail, bonito and rockfish to try for in more coastal oriented waters. Keep on fishing and I hope to see you out on the water!